Oil prices have hit all time highs in the last few years and a new desire to go green has emerged as a top selling point for both automobiles and homes as a result. Preserving our environment through conservation of resources and smart product alternatives is not only a good choice but has become a very popular and almost trendy direction. But this is one trend that will not go out of style, so investing in it now could offer more value in the future (in more ways than one!). If you are one of the many interested in purchasing a green home here are some things to look for on the interior while out on your house hunt. Your main concern on the inside are the appliances, the insulation and the AC/heat. Appliances and the AC/heating unit should have an Energy Star rating and the insulation should be a minimum of 3 inches deep in the attic. Many experts agree that a radiant heated floor is more eco friendly than forced heat because it uses heated water throughout the flooring to create a more even heating as well as producing less dust than a forced air unit. An on demand hot water heater will also help to conserve energy by heating your water as needed, instead of constantly trying to keep 40 gallons of water hot throughout the day and night. 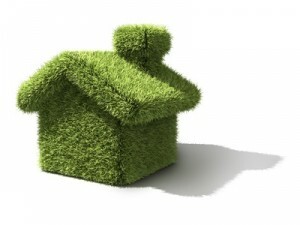 A good idea is also to have a Home Energy Rating audit performed. This will give you all of the pertinent information as well as let you know how to improve your energy efficiency. Most utility companies will do this for you or a qualified home inspector can also provide the report. Your Realtor should be able to refer you to the proper person. If you are looking for a new green home in the Orlando area, then the Banyan Pointe neighborhood in Lake Mary and Savannah Park Townhome community in Sanford offer great homes that are all eco friendly. Historic homes are also a great option beacuase they are not new construction, so they do not require the use of additional resources. But they could require some eco-updates. If you have found a home that needs some green updates then remember to save your receipts, the Federal Government is offering up to $1,500.00 back on qualified eco friendly home updates. For more information about Banyan Pointe, Savannah Park and other green neighborhoods in the Orlando area, please contact us at 407-340-6458 or send us a quick message! Thanks for the great info. Orlando proper does have a lot of choices for any buyer or renter.